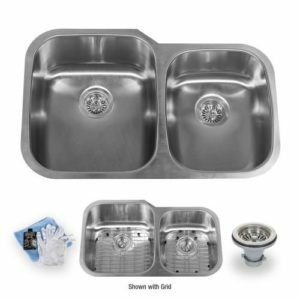 Miseno Sink Reviews and Comparisons - Quality Kitchen Sinks With Style! / Miseno Sink Reviews 2019 – Quality Kitchen Sinks With Style! 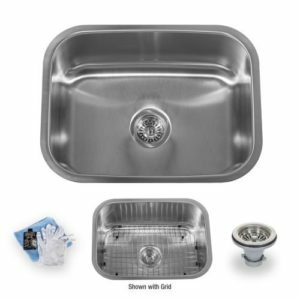 Miseno Sink Reviews 2019 – Quality Kitchen Sinks With Style! 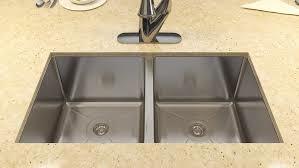 Last Updated: March 25th 2019 Choosing the right sink for your kitchen or bathroom is essential. It’s not just about the style and design but about the utility of any sink. 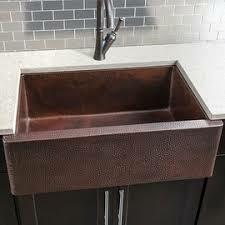 You need a sink that completes your existing decoration and matches existing features. 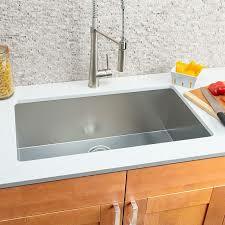 If you have modern features then a modern sink is the right choice, a traditional one might look out of place. Similarly you need to choose the right material and finish to complete your kitchen or bathroom. Thankfully with our Miseno sink reviews guide you will learn everything you need to know! 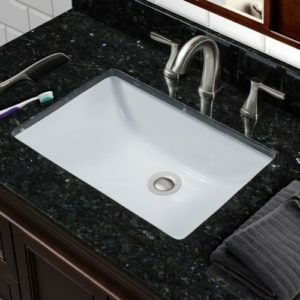 If you are interested in composite granite kitchen sinks, then we recently made a review page about our choices! Ultimately you need a sink that won’t damage easily, will do the job and will stand the test of time. It’s a feature in your home that will get a lot of use and you can’t afford to settle for less. Generally when selecting a sink you want to stick with brands you know. That way you avoid any bad quality from unknown companies. 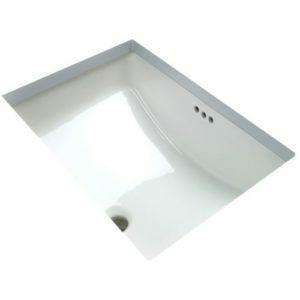 Until recently Miseno sinks were only available on Amazon.com , marketing almost exclusively to contractors and home developers. They’ve recently started to expand and are now available from a range of retailers letting homeowners buy direct. Miseno are showing themselves to have some great products and are definitely one you should consider when buying a sink, even if you haven’t heard of them before. In this Miseno sink reviews guide you will learn about Miseno as a company, the types of sinks they produce, reviews of their sinks, and their warranty information. Miseno themselves have primarily been selling directly to contractors but are available for homeowners too. They’re growing rapidly off the backs of their well made products and you should see more of them in the next few years, being stocked by all the main retailers. Miseno believe in consistent perfection. They take care with every product and have stringent checks to make sure that the quality remains high across the board. 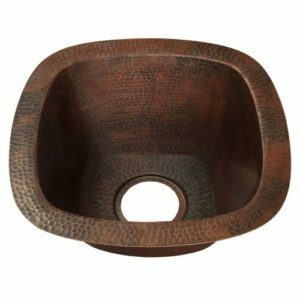 They pride themselves on designing innovative and useful products that bring value to your home. At the heart of the Miseno ethos is to bring joy to your home. They provide luxury units which are useful, practical and stylish, suitable for a number of different homes. 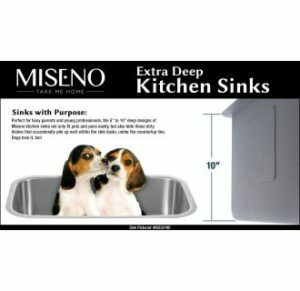 Miseno sinks are known for being some of the most inexpensive on the market. For many that can make alarm bells ring about the quality but actually Miseno are manufacturing some great products. Their sinks are subject to checks throughout the whole process and manufacturing for most of their products is kept local. Their quality seems fairly solid and reliable with few defects being reported in their sinks. Overall Miseno seem like good quality for the price point. They may be less durable than some of the more expensive units but for the low end budget they’re perfectly reasonable. Miseno make products for the whole home, from custom cabinetry to household furniture. They have some impressive products but their line of sinks are proving some of their most popular. Miseno offers range of different sinks to choose from for kitchen or bathroom. The styles available include traditional, modern and transitional. They offer intricate detailing or basic units. There are also a number of unique custom pieces with unique shapes and materials. The type you choose will depend on the space you have available and the type of kitchen you have. It’s always worth going in to see the choices and getting some expert advice on what will work in your home. Once you’ve settled on style and shape you’ll have a number of other options to choose from. First you’ll need to choose the material. The popular choices are porcelain and stainless steel but there are alternatives available made of glass and other materials. Again the choice will be dictated by current home furnishings and decor. It mostly depends on your personal preference and how you want the room to look. If you’re looking for a traditional bathroom then white porcelain is probably the way to go but there are some attractive black options. The best thing to do is visit your local dealership or look online to get a good idea of how the finished product will look. Finishes are a great way to protect your products and helps them stand the test of time. Different finishes are only available for certain materials and it’s clear which can be selected for each. 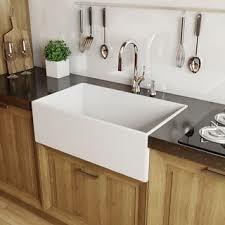 Miseno have sinks available in a range of prices, this means they have something to fit a variety of budgets. Generally they’re considered affordable products which has made them popular with contractors who are trying to limit costs. Miseno are offering a good selection of well made products. The different design options and style choices available to the customer make them suitable for a number of different homes, at affordable pricing. Popular with both homeowners and contractors alike, Miseno sinks are getting very positive reviews, offering a lot more than people expect for the price. “First, the finish is beautiful to look at, however when I looked closer I saw there was a chip right on the top edge which would not be covered with stone” - Dee R.
Mistakes do happen with every company once in awhile, but always be sure to check and double check products when they’re delivered. If you do discover a problem then get in touch with your supplier immediately and see what the options are. Overall Miseno sinks are showing their quality craftsmanship and understanding of the customer in the style choices they offer. They’re affordable but still reliable, giving value to the customer. Miseno back their sinks up with a limited lifetime warranty. This covers all material defects and workmanship issues but not daily wear and tear from usage. Always check with your supplier before purchase, knowing where you stand with a warranty will pay dividends in the long run. Miseno offer a wide range of practical sinks for bathrooms and kitchens. There are a number of different design choices which give you a wide variety of different products to choose from. This means you don’t have to compromise when it comes to your home. That being said, if you like the look of acrylic sinks, then we have a review page as well! Miseno’s biggest selling point is of course their pricing. They have kept their prices low by outsourcing a lot of their production, and while this can mean a dip in quality they’ve done well to keep a close eye on the production process. This means there is consistency in their products. Miseno sinks are perhaps a little more basic in design than other, more expensive, sink manufacturers with less outlandish styles available. However they still have a solid range of products and at this price point they’re a real asset to your home. Miseno are growing fast and you’ll see more of them soon, so if you’re in the market for a new sink be sure to check them out today. 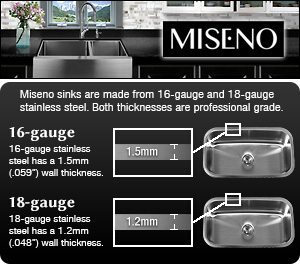 If you liked this Miseno sink reviews guide, then check out our kitchen products section to see other kitchen product guides.